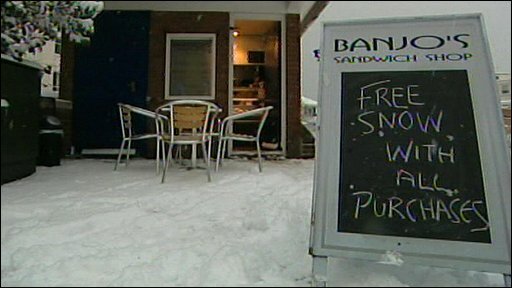 The UK had its coldest winter for 13 years, bucking a recent trend of mild temperatures, the Met Office has said. The average mean temperature across December, January and February was 3.1C - the lowest since the winter beginning in 1995, which averaged 2.5C. February started very cold as the heaviest snowfall for 18 years swept in, but temperatures ended up average. 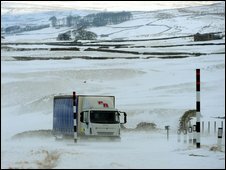 Peter Stott, of the Met Office, said despite this year's chill, the trend to milder, wetter winters would continue. He said snow and frost would become less of a feature in the future. "The famously cold winter of 1962-63 is now expected to occur about once every 1,000 years or more, compared with approximately every 100 or 200 years before 1850," he said. The Met Office added that global warming had prevented this winter from being even colder. In December across the whole of the UK, the average temperature was 3.1C - 1.1 degrees below the long-term average for this time of year. The following month it was 2.8C - 0.6 degrees below average, and in February the average temperature was 0.2 degrees above average at 3.6C. The lowest night time minimum temperature this winter was recorded in Aviemore in the Scottish Highlands at -18.4C. Benson in Oxfordshire recorded -11.8C followed by Shap Fell in Cumbria at -11.3C and South Farnborough in Hampshire at -10.8C. The lowest ever recorded temperature in the UK was -27.2C in Braemar, Aberdeenshire, in 1895 and 1982, and in Altnaharra, Sutherland, in 1995.